Many Audible and Sonos users might have been troubled by questions like above one a lot. In this guide, we would like to show you how to play Audible books on Sonos easily in different ways. You could then freely listen to Audible audiobooks on Sonos device as you like. Before we get deep into the topic of playing Audible audiobooks on Sonos, let’s firstly get a brief understanding on Sonos and Audible. Sonos is a Wi-Fi enabled home sound system that streams music, news, and audiobooks from different services such as Audible, Apple Music, Pandora, Spotify, SiriusXM and more. That means you could listen to almost all kinds of music and audiobooks streaming online at home. On the other hand, Audible is a seller and producer of spoken audio entertainment, information, and educational programming on the Internet. You could listen to digital audiobooks, radio and TV programs, and audio versions of magazines and newspapers from Audible. Audible has also become the world’s largest producer of downloadable audiobooks. Audible’s content is only accessible through special proprietary closed software, including unauthorized-playback prevention by means of an Amazon user name and password. It’s worth mentioning that all Audible audiobooks are DRM protected, which means you could only listen to Audible audiobooks from official website and authorized means. If you want to listen to Audible audiobooks on Sonos, the below solutions would help you. It’s lucky that Audible has finally got back to Sonos. That means an easier access to Audible books from Sonos. No matter you are an Android or iOS user, you could play Audible audiobooks on Sonos with the help of Audible app on Sonos. The below guide would show you how to do this. 1. If your Sonos device is not on, turn it on. 2. On your Android device, open the Audible app and check to make sure there is a Wifi connection. 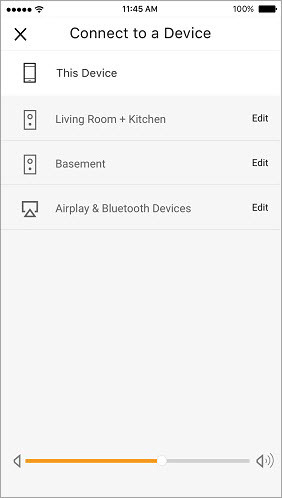 Make sure your Sonos and Android device are connected to the same WiFi network. 3. Tap on a title to begin playing. At the bottom of the player screen, a white pop-up window will display the following message: Sonos devices are available. 4. Then, you need to tap “Connect to a device” button. 5. From the list of available devices, choose your Sonos device. 6. Allow the follow-up permission requests. 7. After authorizing, click the “Continue” button. 8. A short note will appear the first time Direct Control is added. 9. Click “OK” button to begin listening Audible audiobooks on Sonos. 1. Turn on the Sonos device. 2. On your iOS device, open the Audible app and check to make sure there is a Wifi connection. 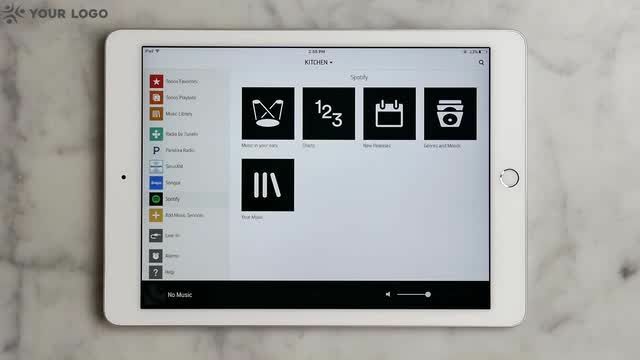 As well, connect your Sonos and iOS device into the same WiFi connection. 4. Then, click the “Connect to a device” option at the bottom of the player screen. 5. From the list of available devices, locate and tap your Sonos device. 6. The device will ask for approval of the several Permissions. Just tap “I agree” button to give permission. 7. A short note will appear the first time Direct Control is added. 8. Tap “OK” button and the Sonos will start to play your Audible title. Note: Narration speed, sleep timer, bookmarks, chapter navigation, Stats and Badges, and Audible Channels are not available when using Sonos at this time. 1. Open your Sonos app on your phone. 2. At the bottom of the main screen, tap “More” option. 3. Tap on “Add Music Services” option. 4. Find the Audible service and tap it. 5. Tap “Add to Sonos” option. 6. 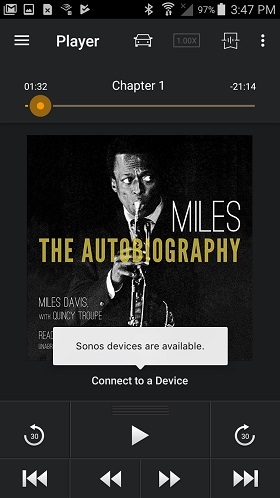 Sign into your Audible account to authorize Audible with the Sonos app. Follow the on-screen instructions to sign in. This is applicable to both Android and iOS devices. You could easily listen to Audible audiobooks on Sonos with the help of Audible app and Sonos app respectively. 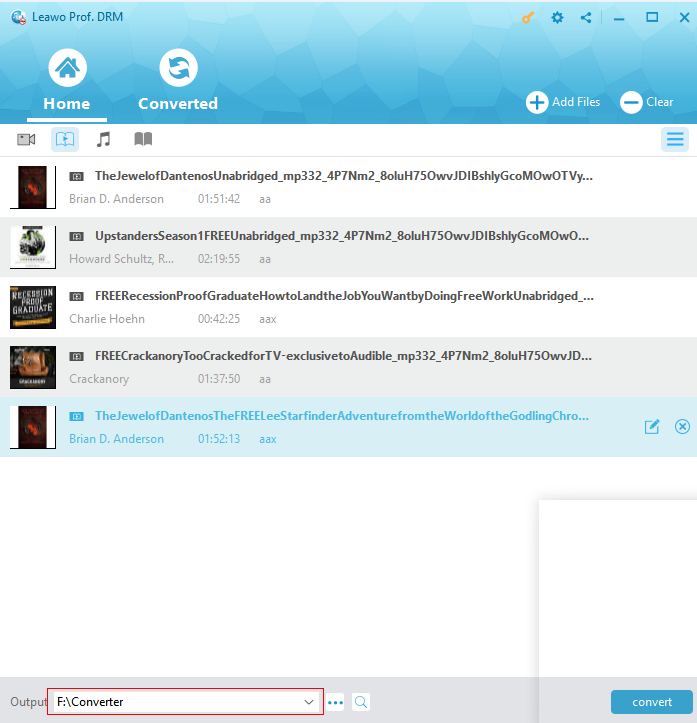 Also, you could make use of some Audible audiobook converter tools to convert Audible audiobooks to Sonos compatible audio files for playback since Sonos also supports WiFi connection playback from your computer. The only problem is that Audible audiobooks are DRM protected, which means you couldn’t directly play Audible audiobooks on your Sonos app. 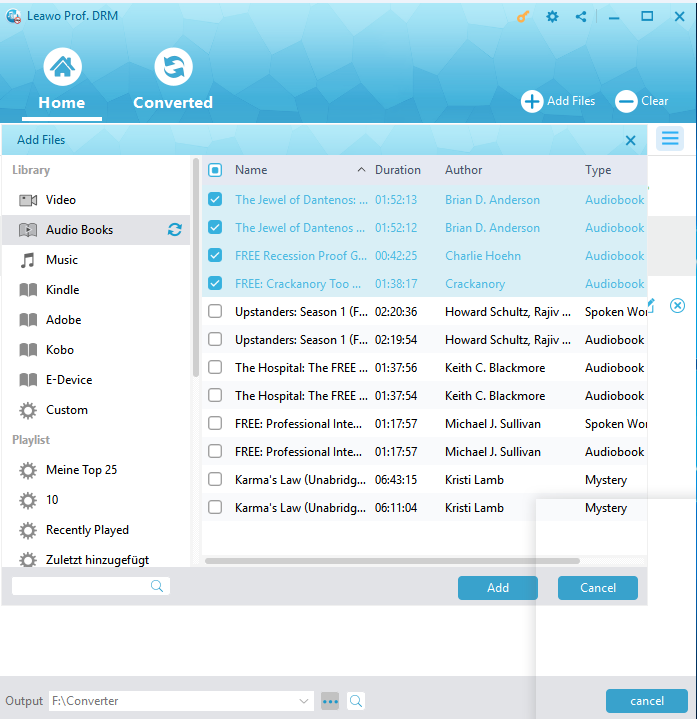 You need to turn to Audible audiobook DRM removal and converter program tools. Leawo Prof. DRM is right what you need. As a professional audiobook DRM removal and converter tool, Leawo Prof. DRM is able to remove DRM from iTunes M4B audiobook and Audible AA/AAX audiobook, and then convert M4B, AA, and AAX to MP3 for freely playback on various media players and mobile devices. Download and install Leawo Prof. DRM on your computer, then follow the below guide to learn how to remove DRM protection from Audible audiobook and convert Audible audiobook to DRM-free audio files for playback on Sonos device via Wi-Fi. Leawo Prof. DRM would import Audible audiobooks from iTunes. Therefore, you need to firstly import Audible audiobooks to iTunes as you usually add other files to iTunes. After launching Leawo Prof. DRM, you can click “Add Files” button on the sub-menu bar to add the M4B, AA or AAX audiobook on the pop-up “Add File” panel. Choose at least one audiobook file and click “Add” to add. After importing the audiobooks, you could click the pencil button in each loaded Audible audiobook title to freely choose Channels, Sampling Rates and Bit Rates for keeping in the output MP3 audio file. Then, click the “Output” drop-down button at the bottom of “Home” list to set an output directory for containing output MP3 file. Finally, click the bottom right “Convert” button to start to convert Audible audiobooks to MP3 audio files. The DRM removal happens in the background. 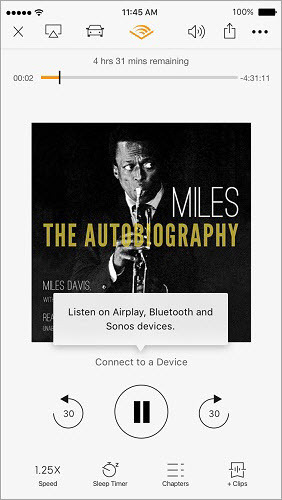 After converting, you could then freely listen to Audible audiobooks on Sonos via WiFi as you usually do. Actually, Leawo Prof. DRM is far more than an Audible audiobook converter that could remove DRM from Audible audiobook and convert Audible audiobook. It could still remove iTunes DRM and convert iTunes DRM M4V video to DRM-free MP4 video, convert iTunes DRM M4P music to DRM-free MP3 audio, convert eBooks from Kindle, Kobo and Adobe Digital Edition, and download Spotify music freely. It is a comprehensive DRM removal and converter tool you could get in the market. Still, you could listen to Audible audiobooks on Sonos through Line-in Connection, a feature that enables you to connect your external devices to Sonos speaker via an audio cable for playing audio on Sonos. 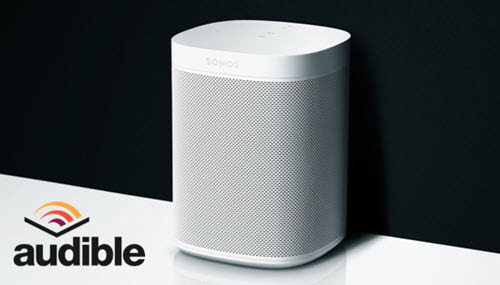 You could use a Sonos player with a line in, like the CONNECT, CONNECT:AMP, or PLAY:5 and send the audio over the cable from another device. Step 1. Please connect your mobile device with Sonos product via audio cable to the Line-In connection on the back of Sonos production. Step 2. 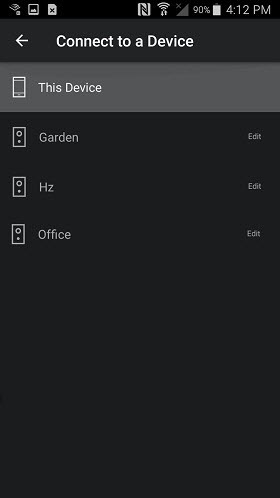 Open the Sonos Controller app to go to More Menu ->Settings > Room Settings and choose the Sonos product you have the line-In connected to. Step 3. Tap Line-In tab -> Autoplay Room, select player name from the Autoplay menu, and close the window to save all settings. Step 4. Start to play Audible audiobooks on your mobile device, and audiobooks will be played through Sonos automatically. It would be very convenient to play Audible audiobooks on Sonos through line-in connection. However, not all the Sonos products support this line-in connection. Else, you need to select ‘line-in’ from the Sonos music menu on the Sonos Controller. All the above ways would help you play Audible audiobooks on Sonos easily. You could freely choose the one that meets you most. The below comparison chart is a simple comparison between these 3 methods as references to you. Obviously, the Audible apps on Sonos help you freely and easily listen to Audible audiobooks on Sonos devices, while Line-in Connection feature allows you to listen to Audible audiobooks on partial Sonos devices. Leawo Prof. DRM is the most comprehensive Audible audiobook solution that enables you to far more than listen to Audible audiobooks on Sonos, but do more things as mentioned above for you.